That is a question I often hear. For some reason, many people cannot think about career relationships without determining what form of leadership is involved. Think about that for a moment. Picture the organization as a pyramid with the leader at the apex and the followers forming the rest of the pyramid. Creative Followers are practicing bottom up thinking. Their focus is on supporting and boosting the leader higher to raise the level of performance of the organization. 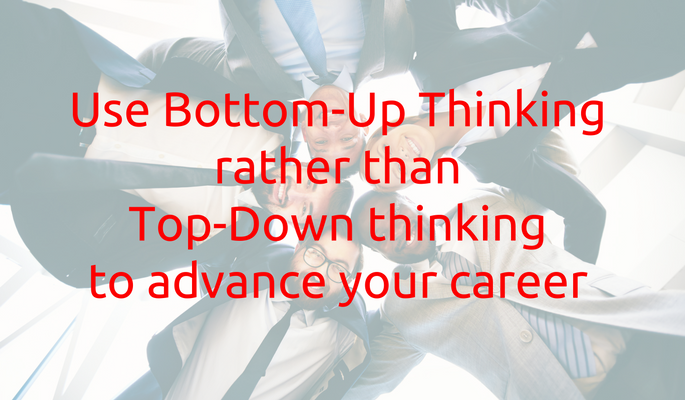 Typical leadership training emphasizes top down thinking. The concept is to look down, reach down and drag up individual followers below in order to raise the level of performance of the organization. Now, be honest with yourself. Which is more likely to result in a more unified and higher performing organization? Will it be the one where many followers are practicing bottom up thinking or the one where the leader is using top down thinking? I place my bets on the organization with many Creative Followers practicing bottom up thinking! This illustration won’t answer every question, but it should give you a clear insight into the value of Creative Followership. It will work for anyone at any level of responsibility in any organization. Subscribe today early notification of new blogposts and occasional updates.